Everyone has heard of Charles I of England, who was beheaded in 1649 for high treason. Not everyone, however, has heard of Charles's elder brother, Henry Frederick. This 'faire and strong' Prince of Wales, as described by the prince's chaplain Dr. Daniel Price, was destined to be king of England, but his unexpected death in 1612 meant that the crown passed instead to Charles. 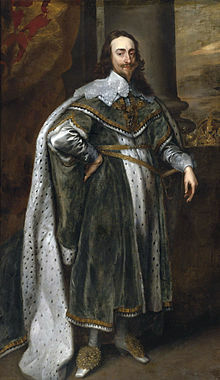 Henry was born on 19 February 1594 at Stirling Castle. He was the eldest child of James VI of Scotland and Anne of Denmark. Nine years later, his father became king of England upon Elizabeth I's death. Henry grew up at Stirling Castle in the care of John Erskine, earl of Mar. The prince was legally separated from his Roman Catholic mother, which caused Queen Anne considerable anguish. Within a year of her son's birth, the queen began to fight the arrangements in place, but she was eventually reconciled both to her husband and to Mar. Henry remained at Stirling until the spring of 1603, the year he turned nine. 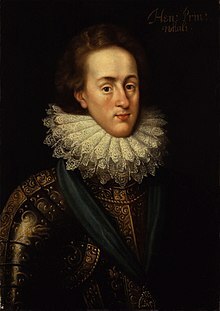 When his father became king of England, Henry was made duke of Cornwall, to add to his titles of duke of Rothesay, earl of Carrick, baron of Renfrew, lord of the Isles and Prince and Great Steward of Scotland. Above: Henry's parents, James VI of Scotland and Anne of Denmark. At the age of five, Henry was granted a tutor, Adam Newton, and the learned Sir David Murray was placed in the prince's bedchamber to assist Newton with the education of the prince. Henry soon proved gifted at sports and physical exercise. 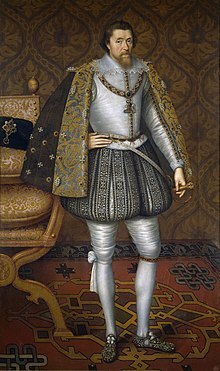 Upon his father's accession to the crown of England, Henry and his mother departed for England, where they arrived in June 1603; at Windsor Castle, Henry was made a knight of the Garter. This departure from Scotland had been accompanied by family drama. The pregnant queen had insisted that her son be handed over to her, and when she was rebuffed by Mar's mother and younger brother, her anger and despair were so intense that she suffered a miscarriage. Once in England, the prince's household was formed. Sir Thomas Chaloner was made governor, while Newton and Murray were retained as tutors. 141 men and youths resided in the prince's household. The Venetian ambassador was acquainted with Henry at Oatlands Palace in August 1603, and noted: 'He is ceremonious beyond his years, and with great gravity he covered and bade me be covered. Through an interpreter he gave me a long discourse on his exercises, dancing, tennis, the chase'. At the age of nine years old, Henry was already dignified and regal in his carriage. He seems to have been well aware of his glorious destiny as the future king of England, and was determined to demonstrate his suitability for the role. Henry was interested in the cultural activities that were popular at court. He attended a masque at Winchester in the autumn of 1603 arranged by his mother, and attended her Twelfth Night masques in 1604, 1605 and 1608, as well as attending entertainments hosted by Robert Cecil, earl of Salisbury. But his love of sports was renowned. 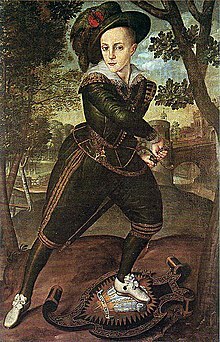 The French ambassador reported in 1606 that, while the prince studied for two hours a day, he 'employs the rest of his time in tossing the pike, or leaping, or shooting with the bow, or throwing the bar, or vaulting'. He was also interested in both the military and navy, and encouraged his friends to send him secret reports on French fortifications. Henry was also well known for his Protestant faith. The treasurer of the prince's household, Sir Charles Cornwallis, explained that Henry was 'a reverent and attentive hearer of sermons', and believed that financial aid should be given to the poor. He was opposed to Roman Catholicism and believed that recusants should be brought to justice. Somewhat ironically, in view of this, the prince was offered more Roman Catholic marriage proposals than Protestant. As heir to the throne, the subject of Henry's marriage attracted great interest. In June 1610, at the age of sixteen, Henry was created Prince of Wales and Earl of Chester at Westminster Palace. The ceremonies accompanying the investiture were lavish. James M. Sutton comments that 'this extraordinary quasi-sacramental parliamentary installation was surrounded by a whole year of court festivities that further demarcate 1610 as the signal year in Henry's short life'. The prince was a sight to behold. He was, according to a contemporary writer, 'tall... strong and well proportioned... his eyes quick and pleasant, his forehead broad, his nose big, his chin broad and cloven, his hair inclining to black... his whole face and visage comely and beautiful... with a sweet, smiling, and amiable countenance... full of gravity'. Installed at St. James's Palace, Henry was a major patron of the arts. His musical activities were noteworthy; his household musicians formed the first new group added to the royal music since Henry VIII's reign, and his musical patronage is notable for its Italianate interests, including the employment of the musician Angelo Notari. He collected mannerist paintings from northern Italian and Netherlandish artists, and after he acquired Lord Lumley's library in 1609, was an avid collector of books until his death. On 6 November 1612, at the age of eighteen, Henry unexpectedly died of typhoid fever, and was buried at Westminster Abbey on 7 December. His death occasioned widespread grief. Charles Carlton notes that 'few heirs to the English throne have been as widely and deeply mourned as Prince Henry'. The prince's younger brother Charles was the chief mourner at the funeral. Four years after Henry's death, Charles was created Prince of Wales and Earl of Chester. It was he, rather than Henry, who succeeded James as king of England in 1625. Above: Charles I, brother of Henry Frederick. The prince's death was lamented by his chaplain, Dr. Daniel Price, in a number of sermons, in which Price stressed that Henry, 'while he lived, was a perpetuall Paradise', 'that blessed Model of heaven'. A large number of verses were written about Henry's passing, including by William Alexander, Joshua Sylvester and George Wither. Prince Henry's Grammar School in Otley (West Yorkshire) and Prince Henry's High School in Evesham (Worcestershire) were both named after the prince. On 18 October 1541, Margaret Tudor, Queen Dowager of Scotland, died at Methven Castle. She was six weeks shy of her fifty-second birthday. Margaret was the elder sister of King Henry VIII of England, and was the eldest daughter of Henry VII and Elizabeth of York. In 1503, at the age of thirteen, Margaret married James IV of Scotland at Holyrood Abbey. Only one of their six children survived infancy: the future James V of Scotland. Margaret's husband was slain at the Battle of Flodden in 1513. She married twice after his death. Her second husband was Archibald Douglas, sixth earl of Angus; by him, she gave birth to a daughter, Lady Margaret Douglas, in 1515. Her third husband was Henry Stewart, Lord Methven. Above: Methven Castle. Margaret died here in 1541. Margaret's last years were not necessarily happy ones. Her son, who became king in 1513, differed with her over foreign policy, for Margaret favoured close ties with England, her home country, whereas James elected to renew the French alliance. Margaret seems to have hoped that England and Scotland would unite in marriage, as she had done by marrying James IV. It was anticipated that her son would marry Mary, daughter of Henry VIII, and Margaret's niece. This was fated never to take place, and James V went on to marry Madeleine of France in 1537. Margaret was particularly unhappy in her third marriage, to Lord Methven. She regularly wrote to Henry VIII complaining of Methven's love affairs and her debts. Margaret wished to divorce her husband, but she was blocked in doing so by her son. In late 1537, she attempted to escape to Berwick, but was intercepted. Madeleine of France had died earlier that summer, and James went on to marry Mary of Guise, by whom he had a daughter, Mary Queen of Scots. It is clear that Margaret was lonely during her final years. She had little influence with her son, and her relationship with her husband was acrimonious. Henry VIII refused to invite her to England and was content to ignore her. At Methven Castle, the dowager queen suffered a stroke. She asked that her valuables should go to her daughter Margaret Douglas, but James ignored his mother's wish and her goods reverted to the crown. She was buried in St. John's Abbey in Perth. Although Margaret's marriage to James IV, ultimately, failed to secure peace between the warring kingdoms of England and Scotland, her great-grandson James VI of Scotland's accession to the throne of England in 1603 brought the conflict between the two kingdoms to a close.